Customer Segments & Value Proposition: What comes first? I love the business model canvas. I really do. For me it is an ideal tool to work on and fine-tune your business model, and it works great in workshops with customers too. At the end of such a workshop my client has a better, deeper understanding of her business, knows what the most important factors for business success are and knows where to focus. And, as a byproduct, every participant is on the same page. Don’t underestimate this, I had quite a lot of meetings where it became clear early on that even the founders had a different (and sometimes opposing) view of what they wanted to do. But that’s a different story and a different post. The canvas has 9 sections. So, the most frequent question is: Where do I start? For me there’s no definite answer, but I usually start either with the value proposition or the customer segment. the client already has a precise idea of the customer segment. the value proposition is the same as the value proposition of the competitors. How is your business different from theirs? the value proposition is unclear. This is often the case when the client invented some cool new technology but has no idea how to generate value with it. the value proposition is non-existent. You think you add value when in fact you don’t. the business offers more than one product/service where each provides a different value proposition. How do these pieces fit together? the client already has a precise idea of the value proposition. the client wants to target a new audience with an existing product/service. Often the case when the client wants to expand her existing business. the customer segment the client has in mind is too broad. You can usually figure this out quite easily. Ask the client who benefits from their product/service. If the answer is “everyone”, grab a pencil and work on the customer segments. the customer segment the client has in mind is too narrow. If the customer segment is, for example “male dentists between 30 and 35 who have 5 kids and 2 dogs, interested in cricket and passionate wine lovers” – well, your audience is probably too small to generate a viable business. Whatever approach you take, you will probably notice that you still switch between value proposition and customer segments constantly. And this is all fine with me. In the end, the business model canvas is nothing but a tool that helps you talking about and defining your business. Since all segments are interconnected, it’s ok to switch during conversation. However, you need a very good and strong moderator in such a situation: Often the conversation jumps from segment to segment constantly so that neither is really covered in depth. The moderator’s job is to recognize when the conversation is starting to float too much and to give the discussion focus again. You can download a PDF version of this canvas on the Alexander Osterwalders blog. 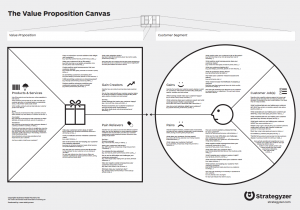 The value proposition canvas is copyright by Alexander Osterwalder and team. This fictitious conversation covers the value proposition and the customer segments at the same time. And it does not feel awkward or unnatural at all. By starting the discussion this way (and of course taking down a lot of notes) you have the perfect input for the value proposition and customer segment sections of the business model canvas. You can even re-use the post-its you created and move them from the value proposition to the business model canvas. If you work with the business model canvas you’ll have to decide with which segment you want to start. Usually it’s value proposition or customer segments. 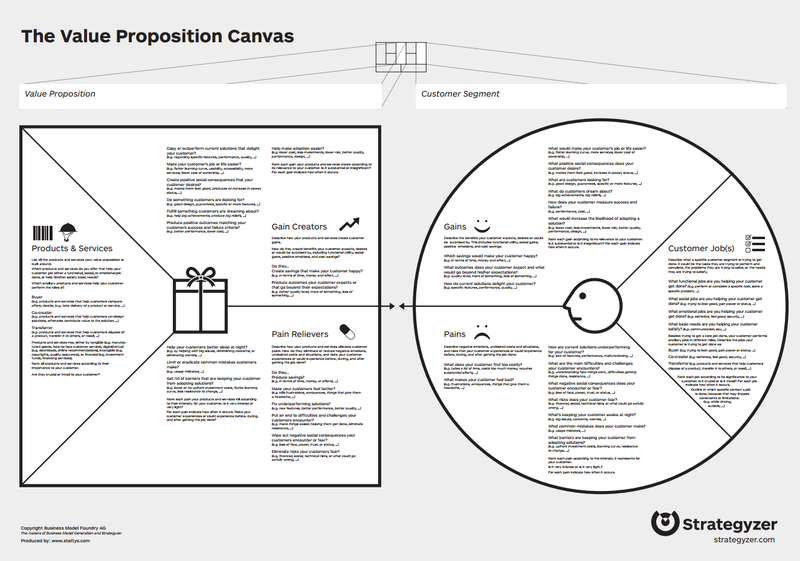 If you find yourself in the situation where you jump between these segments constantly and the discussion therefore is not very fruitful, try using the value proposition canvas as a “precursor” to the business model canvas.